Hi guys! This is my first step out of the shadows here, so advice is very much the word of the day. 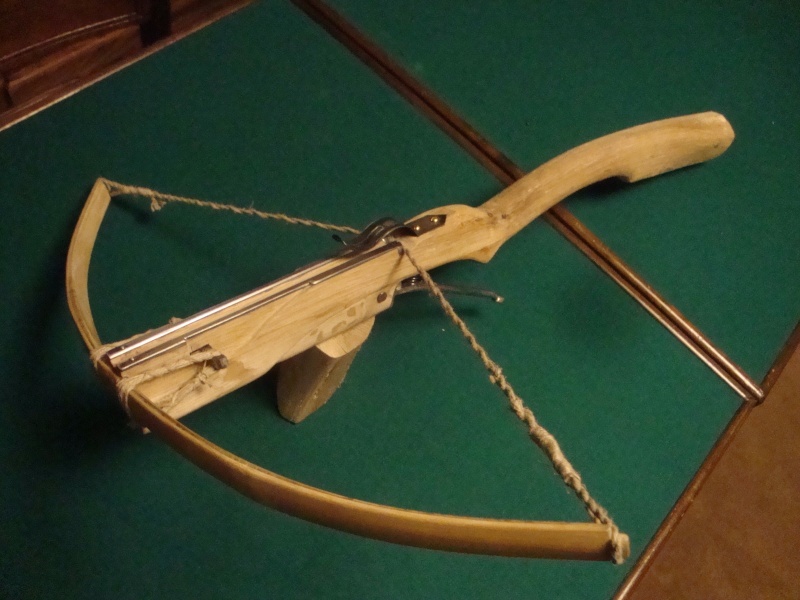 This is my second crossbow, after a wee little 1.5# toy i made from a scrap of bamboo. The point here is to aquire the skills and knowledge to move on to more "full size" bows. The prod is english oak that i aquired as a log, made a flimsy first shortbow out of, and then turned, as a sort of fun sunday afternoon experiment, into a small prodlike thing i backed with bamboo. It came out very surprisingly tough, reaching 35# at around 10 inches, being only 22inches long. Thus it became perfect for my learning process! 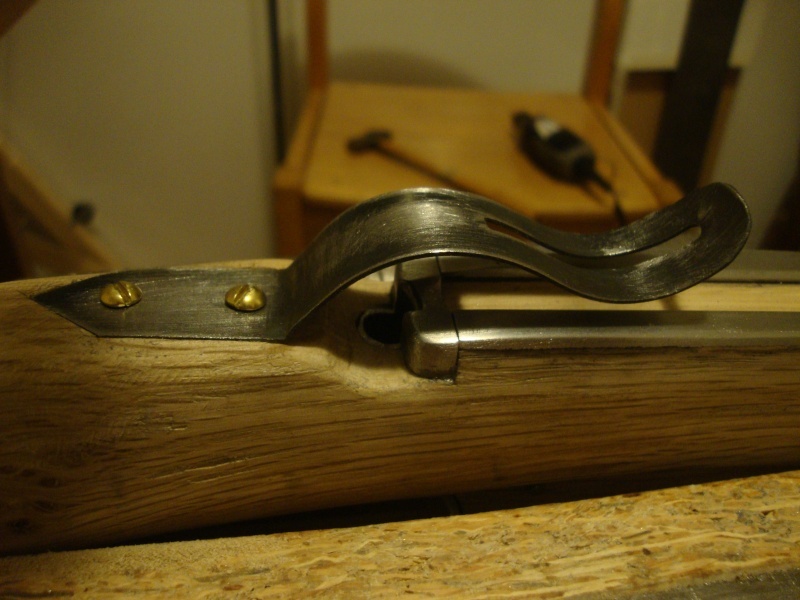 One of the quarters of the split log quickly became a rough stock, and with some iron and steel parts i managed to make out of iron stock and waste sheet steel, using a push peg simple trigger, it all came together as a quite fun experiment. Im working on a bridle block and stirrup, for confort mostly, and a sighting system of sorts, using the bolt clip probably. Then its on to sanding, some detail carving and finishings. Planning on going linseed oil and clear varnish, to bring out the oak's grain, which i like very much. Re: My very first second crossbow! Also, hi. 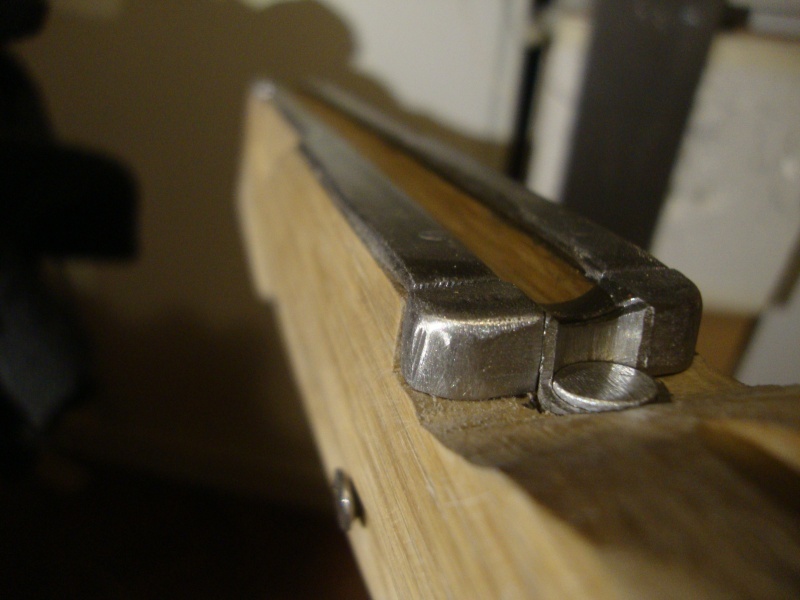 The offset is still used in gun stocks today. Its called cast on or cast off (depending on which way the stock is offset). In rifle/shotgun stocks it not used as an aid for aiming but is used for felt recoil management in hard kicking cartridges. Cast on ,I believe ,throws the barrel more in front of your face. It gives quicker a sight picture. If your not used to seeing this ,you'll the stock is really warped cause, you have no trouble seeing it.Some of it has to do with your neck ,and reach and so on. Gentlemen, thank you very much for the input! 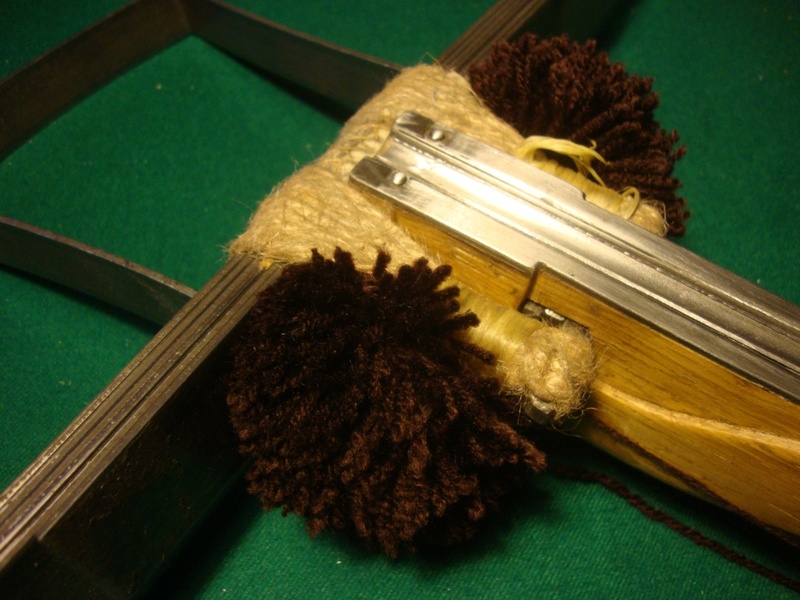 Things stand like this, on this forsaken piece of land the ocean doesn't seem to want: Groove done, string failure, stirrup done and mounted, string failure, bindings tightened, made a ponpon. Here are some pics, as tired fingers cannot explain very much by way of typing. 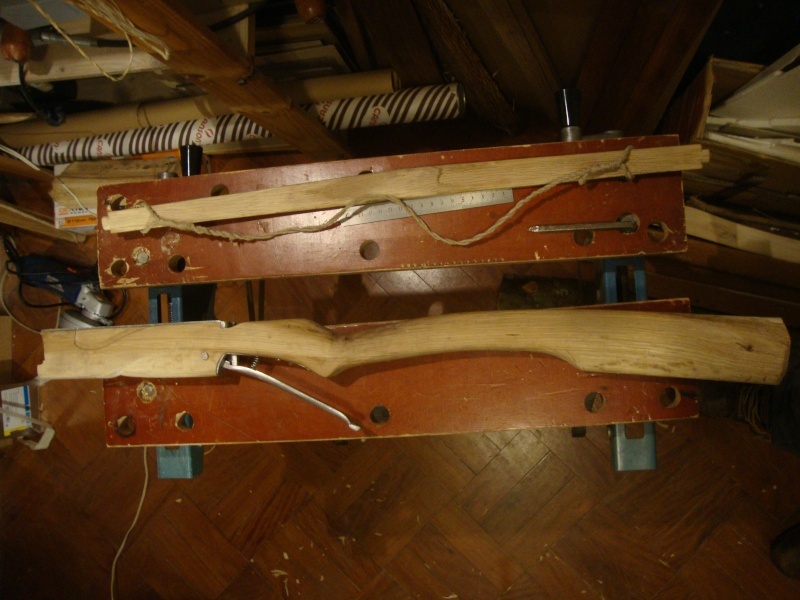 Oh, i must alert you all that my offset stock was a product of the natural bend in the oak log it was carved from. I did take into account which side to make the top side, so that the curve could fit my stance, but at the time i had no idea what i was doing. Joao; By golly you really fancied that bow up . She's fit for a knight. 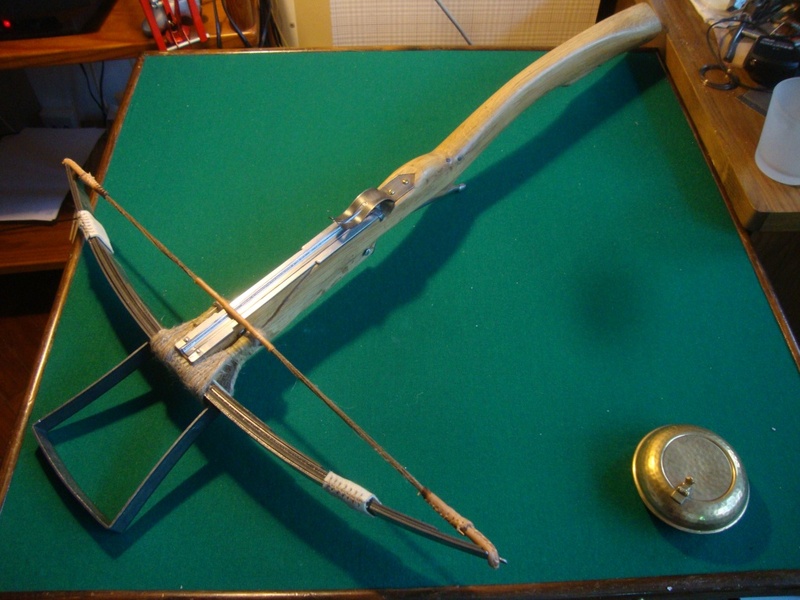 I'm an archer and I make all kinds of different bow strings . Anything from 25# up to and including 100#. In a regular bow 100# is considered almost impossible to pull but, there are men that can do it.For your type of bow I'd say to use B50 Dacron fiber.Dacron has the ability to absorb a lot of punishment and still perform. 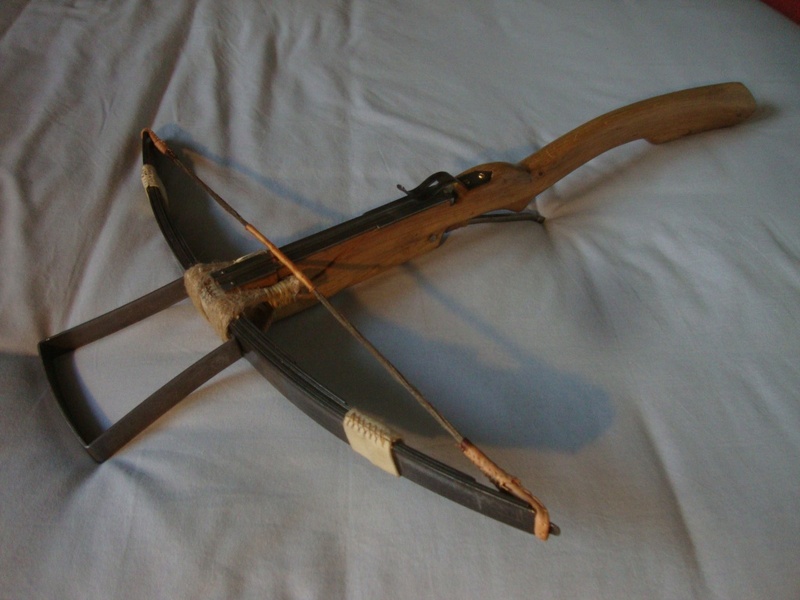 For instance I know of people that have dry fired , and the bow survived .Can't do that with most other material. Where exactly do you live? I'm in the United States. What I'm getting at is maybe some simple way I could help you out. If this is possible ,I would be honored to be of use.By the way, how much did you end up pulling for your bow? Also ,back further in the post you made mention of using sharpies. I think you didn't quite get the point. What I think was meant was-- you can buy what is called temp-slik. They look like a sharpie. You mark your metal piece to be heated with them.When that temp is reached the marker melts. It's pretty accurate too. A poor man's thermometer for metal working, and quite cheap really. Sitas, thank you:) I live in Lisbon, Portugal, we are half a world apart! 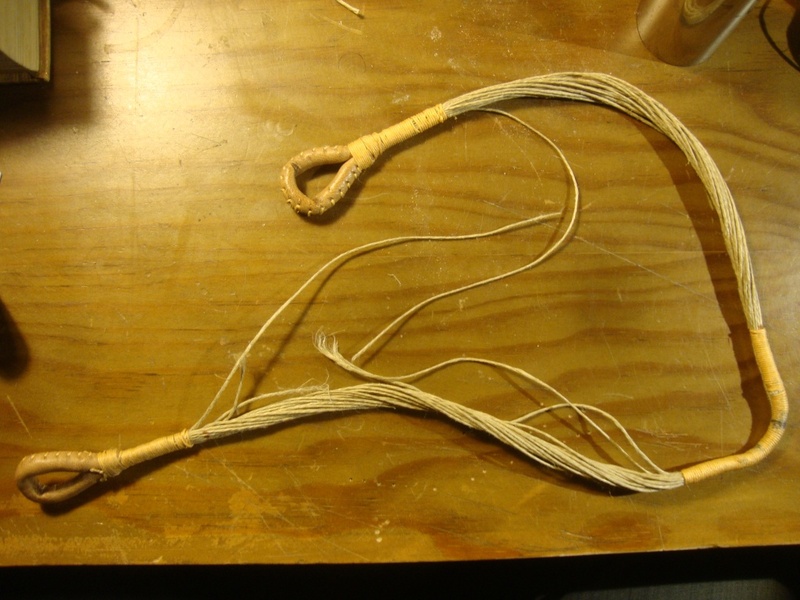 I have made a new flax string, thicker this time (around 8mm), which made me go back to the thicker, heavier bolts. So now i have to find a way of getting a durable thinner string (around 4mm dia), to use the thinner bolts. My prod is pulling around 80#, so my guess for the string break was the near dry-fire that came from using the very light bolts as an experiment, seeing that the string broke 1/3 of the way from the nock. I went on a bit of a research and found out this video on youtube, describing what seems like a solution for my problem, a knotted string, where the nocks are the same thickness as the center. What i'm still experimenting is how long the skein has to be before knotting to get the required length in the end. My figures are somewhere around 10-16cm longer, depending on thickness. If someone knows German, i think he explains something about the extra length, in the beginning. 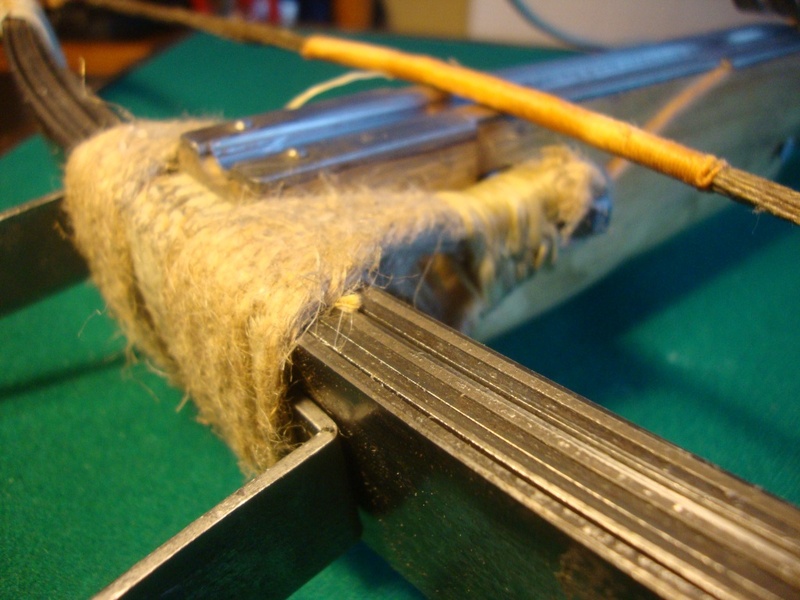 I searched the forum for a bit and didn´t find anything related to this kind of string, of which Payne apparently had no knowledge of, according to his chapter on bowstrings, where he says something along the lines of "i have no idea how this (same thickness on nocks and center) could have been done except for an auxilliary loop" . 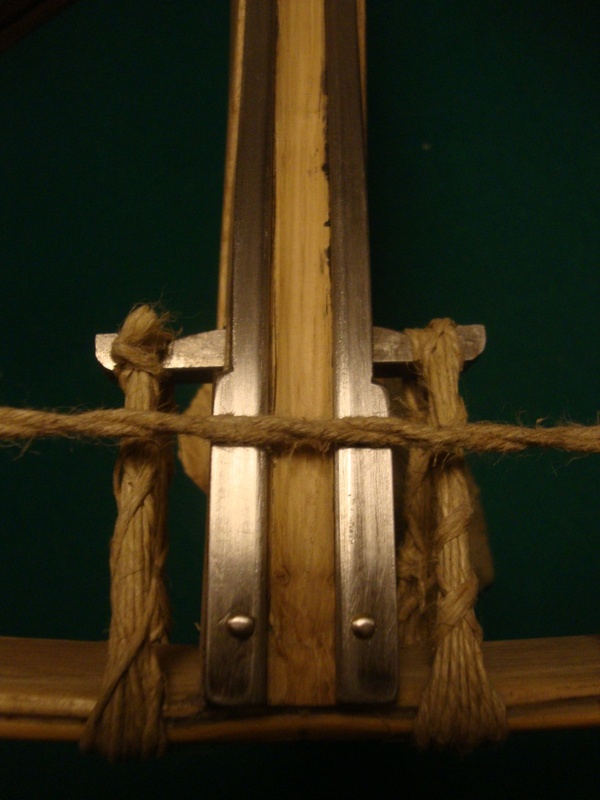 I have seen this string on a few german crossbow images before, but never could make out how to do the knot. Maybe this will add to the general knowlegde, and perhaps you or others who have made this kind of string can give me a tip or two. Ps. : Thank you very much for the offer Sitas! Would you like to trade a couple of broadheads for a string? Pps. : Dum me, i had no idea such a nifty thing as that kind of pen existed! Joao, You hit the nail on the head. I was thinking more like trying to send you a roll of proper material. I could send a couple of strings to get you started. In the mean time ,I will check and see what it takes to do this. Just glance back from time to time while I check . I'll go about it right away. Joao please send me a message.